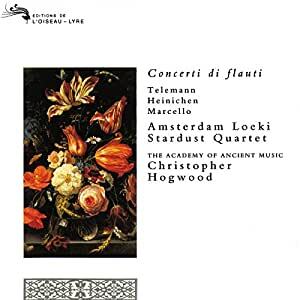 This is not the first baroque/ early baroque wood instrument album one would buy most probably. People tend to go for more famous composers. This album targets the audience who have had enough of the household names, and want to delve deeper into this genre. Some composers' names were unheard to me, so after my first listening this album turns out to be one of my best finds of this year. The Academy of Ancient Music title produces gold! Contains concertos for recorder by well-known composers Vivaldi, Telemann and Heinichen; and little-known, but competent, composers Marcello and Schickhardt. I had never heard of the latter two before, but the first piece by Schickhardt is actually the most effective piece on the record.